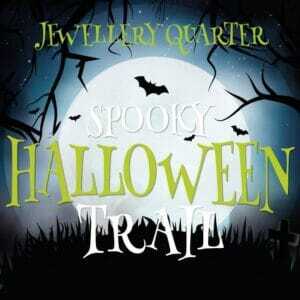 Celebrate Halloween in the historic Jewellery Quarter throughout October half-term with the Jewellery Quarter Halloween Trail! There will be no tricks only free treats for any families who visit one of the five participating venues in costume between Saturday 27 October – Sunday 4 November. Pick up one of the free trails for the full list of participating venues featuring a bespoke map by local Jewellery Quarter artist Thomas Parry. The trail is also designed to hold your stamps and stickers at each venue which will unlock special offers on your next visit! Finally, be sure to share your spooky selfies on social media throughout the week. The participating attractions include The Coffin Works, The Hive, The Pen Museum, RBSA Gallery and Museum of the Jewellery Quarter. The tasty treats have been generously donated by Newhall Square Co-op. Please check the individual venues for opening times and booking information. For more information please visit www.jewelleryquarter.net/newsor contact the JQBID at info@jqdt.org or call 0121 233 2814.